In 2017 we created Zebra Color - a new series of functional toilet paper with added innovative Easy Open for easier storage of the products without the need to tare the packaging. It is offered in 4 and 8 rolls. 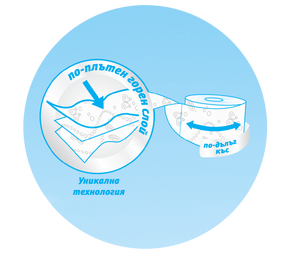 In 2014 Zebra created the first toilet paper in Bulgaria, with a denser upper layer for added comfort and absorption - Zebra White. In 2013 we created Zebra ECO - the first toilet paper produced in a bio-degradable packaging.